Elaine Chao will get millions from Wells Fargo. 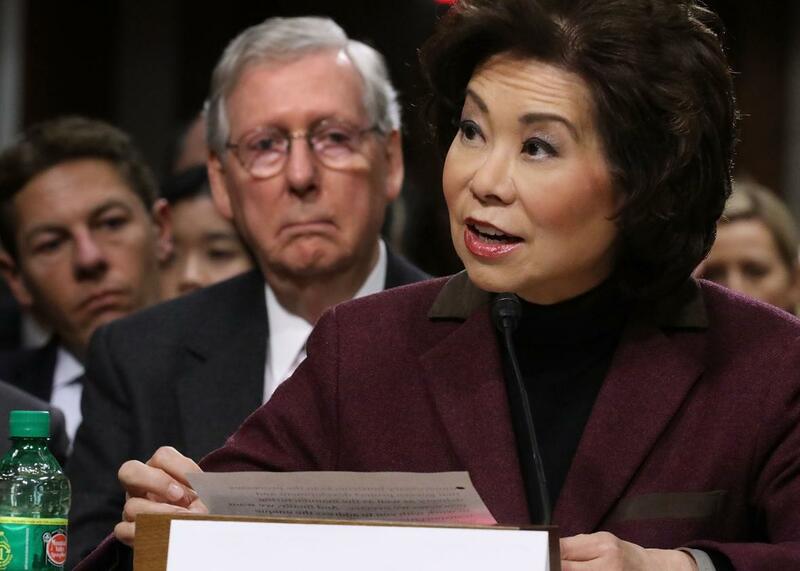 Elaine Chao testifies during her confirmation hearing to be the next U.S. secretary of transportation before the Senate Commerce, Science, and Transportation Committee. Elaine Chao is certain to be confirmed as President-elect Donald Trump’s secretary of transportation, but that won’t be her only source of income when the new administration takes over. As Lee Fang reports Tuesday at the Intercept, Chao will receive payments of between $1 million and $5 million over the next four years for her service to Wells Fargo, according to her financial disclosure forms. Talk about a swamp draining! Chao joined the board of Wells in 2011. If that year sounds relevant to you, it might be because that’s when the Consumer Financial Protection Bureau says Wells Fargo began to look the other way while its employees, desperate to keep up with unrealistic sales targets, opened up 2 million unauthorized accounts on behalf of unsuspecting customers. But there’s a good case for Chao having to account for her time at Wells. It’s highly unlikely, after all, that the contours of the Wells Fargo scandal were unfamiliar to her and other board members. The Los Angeles Times published an investigation of suspicious doings at the bank in 2013, quoting one employee who complained of being told workers who couldn’t keep up would “end up working for McDonald’s.” The Los Angeles city attorney’s office filed a lawsuit against the bank in 2015 based, in part, on the newspaper investigation. Fang goes on to elaborate one reason Wells might look kindly on Chao returning to public life. The secretary-designate said at her hearing last week that she would encourage public-private partnerships to find money for the increased infrastructure spending Trump covets. If you guessed Wells Fargo is one of the financial-services behemoths likely to finance some of these deals, make your way to the head of the class. None of this is remarkable for a Cabinet pick, but you might think it’d be disqualifying in the administration of someone who promised to drain the ethical swamp. Candidate Trump may have ceaselessly badmouthed Hillary Clinton for collecting several hundred thousand dollars for speaking at Goldman Sachs, but he’s stacked his administration with enough Goldman veterans that they could host an employee reunion at the White House. Chao’s payout from Wells is simply the latest reminder that Trump isn’t draining the swamp, but turning a fire hose on it.